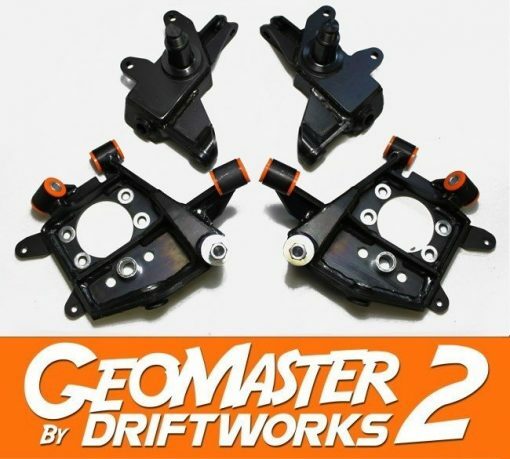 GeoMaster2 drop knuckle kit for Nissan Silvia & 180SX (Japan), 200SX (Europe) & 240SX (USA) S13, S14 & S15 models. The ultimate street style drop knuckle kit for drifting & track use. The Front knuckles provide approximately 45mm of roll centre correction, & superb steering angle with no over centre issues (where your steering gets stuck on full lock), The steering is quicker & steering feel is excellent. 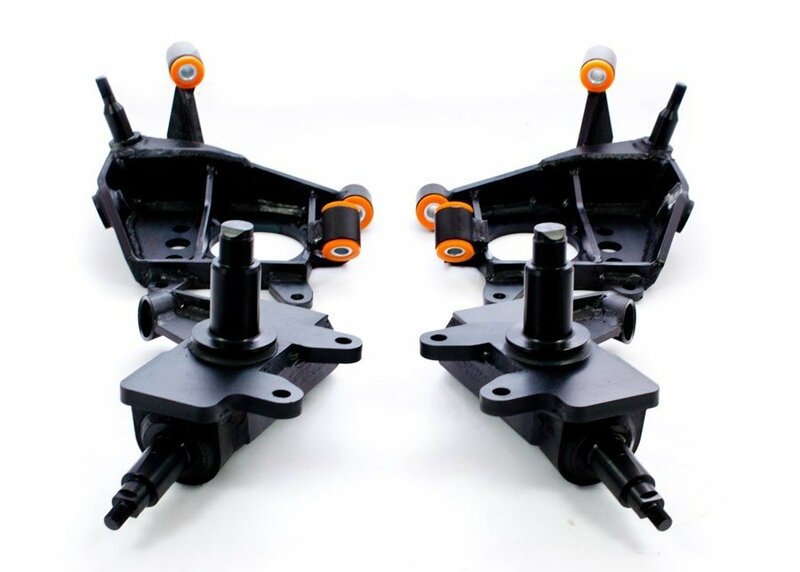 The Rear knuckles offer the perfect balance to the fronts with approximately 50mm of roll centre correction, polyurethane bushes. and huge improvements in dynamic toe and camber gain. They essentially straighten out those alignment arms that point up to the sky on normally lowered Sbody. 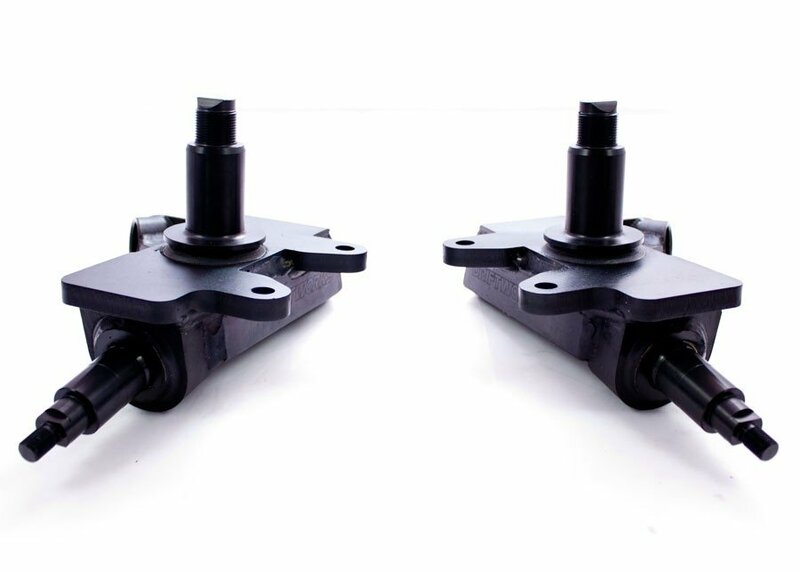 Offset rack spacers move the inner tie rod ball joint forward in the same way as modifying your cross member to move your steering rack does. This gives a huge reduction in the chance of going over centre, which is when the steering binds on full lock. Although a lot of customers do use them on the streets, it is very much sold as a track only product. Not for street use. 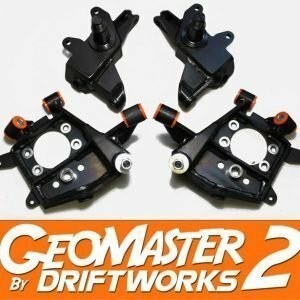 We recommend using Driftworks Control System Coilovers and a Driftworks four arm alignment kit when fitting Geomaster2 Knuckles! We cannot guarantee fitment with different brand coilover systems & suspension arms. With these dropped knuckles we recommend 18″ wheels, although some 17″ wheels will fit. Track rod length is affected by the lower arm extension, and the Geomaster knuckle. Most customers use our Geomaster tie rods with the offset rack spacers. 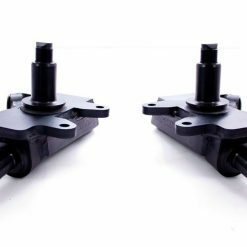 If you have moved your rack, you may need to extend the track rods further because you won’t be using our offset rack spacer. Although it is a bolt on solution, it can limit other components, for instance you may find your coilover is not capable of going high enough. You may find you have clearance issues with tension rods due to the incredible amount of steering lock the hubs can achieve. 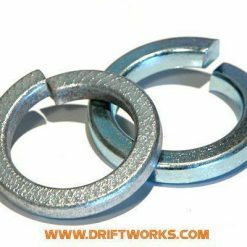 All of this we have experience with, and we can help you with if you are using the full Driftworks kit. There is no provision for ABS. This is a track only product. Only a 5 stud wheel bearing will fit the front spindle. To fit them to an S13 you will need a 5 stud front wheel bearing from an S14 or S15 (only). To fit the fronts to an S13 you will also need to drill the holes out in the bottom bracket of your coilover to 14mm, and use 14mm bolts from an S14/15 with some washers, as the diameter of the hub where the coilover mounts is slightly slimmer on the S14. 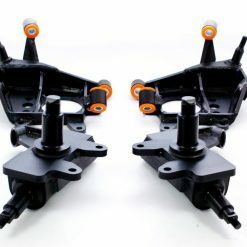 You will also need S14 fitment front lower arm balljoints. To fit the rears to an S13 and retain the drum handbrake, we have included the necessary holes in the back plate. 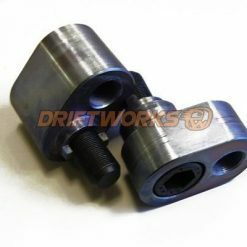 Some brake components will need swapping from the left to the right side to work, and other minor modification may be required.